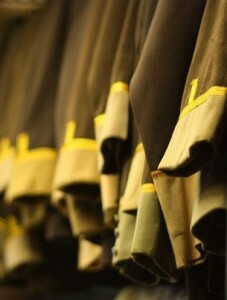 The majority of the Cinema Museum’s uniforms date from the 1930s to the 1950s, with many from the James F. Donald (Aberdeen Cinemas) Ltd. Uniformed staff were integral to the experience of going to the cinema in the last century, especially from the 1920s until the decline of cinema-going in the 1960s and 1970s. There would be a commissionaire to greet customers, a hat-check person, attendants and usherettes. The detail and variation in uniforms were part of a cinema’s identity. Historian David Trigg has been painstakingly researching the history of cinema uniforms in the Cinema Museum’s extensive periodicals library, with a view to mounting a uniforms exhibition in collaboration with the Museum.